Check Out BeckerTime in CEOWORLD Magazine! 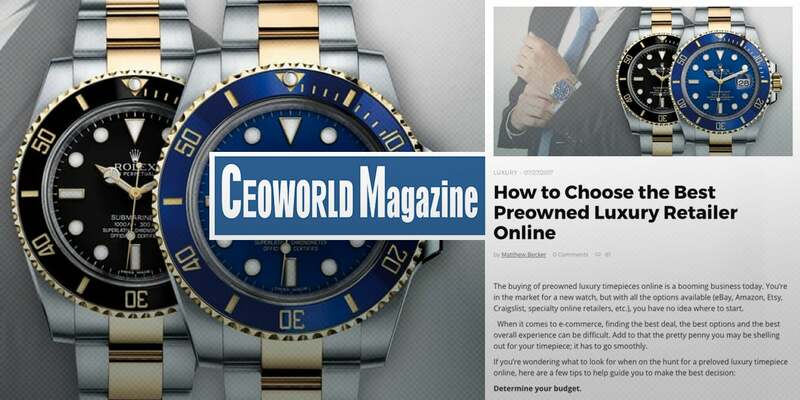 Did you see BeckerTime in CEOWORLD Magazine this week? With nearly 20 years of experience selling preowned luxury timepieces, CEO Matthew Becker knows a thing or two about how to choose the best preowned luxury retailer online. But, with all the online options available where do you start? Matthew Becker shares a few tips with readers of CEOWORLD Magazine to help guide you to make the best decision. In case you haven’t seen it, find some of the highlights below. Determine how much you’re willing to invest. For instance, a good rule to follow is to spend about one month’s salary on your first preowned luxury timepiece purchase. Understand the true value of a preowned luxury watch. Do your homework! Don’t settle for the first website you look at; instead look for a seller that specializes in what you’re buying. Only purchase from an online retailer that genuinely cares about the customer and isn’t looking for just another sale. Look for online preowned luxury retailers who offer a warranty on their timepieces. Find an online luxury retailer that creates added value for you as a long-term customer. CEOWORLD Magazine is the world’s leading business magazine written strictly for CEOs, CFOs, top managers, company directors, investors, senior executives, business leaders, high net worth individuals, and the most globally powerful men and women. With content that ranges from successful business strategies and emerging trends, to expert opinions and proprietary research, it’s no wonder CEOWORLD Magazine has seen more than 12.4 million page views!